Purchasing LED bulbs for your home has many advantages. Lighting your home is essential. For many years, the only light bulbs that were widely available to light our homes were incandescent light bulbs. They were available in a wide variety of strengths and had to be changed every couple of months. Today, those incandescent bulbs are almost completely gone in favor of more efficient and longer-lasting LED bulbs. Purchasing LED light bulbs for your home has many advantages. If you find that the lights in your home stay on longer than they’re off, then LED bulbs are a great investment for you. Frequently, homes with children and teens have more lights on for more of the day. Younger children tend to play with light switches as soon as they can reach them, while the older crowd simply forgets to turn them off (all the time!) If you don’t want your playful littles or forgetful teens to run up your electric bill, put some LED bulbs in those lamps! Whether it’s the chandelier at the top of the vaulted ceilings in your entryway or that one fixture outside that’s always got some sort of gross bug making a home inside of it, we all have one or two light fixtures that we just don’t like to change. Well, LED bulbs last around 25-times longer than standard incandescent light bulbs, so chances are you’ll only have to deal with those hard-to-reach fixtures every couple of years! In the spirit of saving the best for last, our last advantage to LED bulbs is that they are incredibly energy efficient. They are so efficient that they actually produce more light using a small fraction of the energy that incandescent or CFL bulbs use. 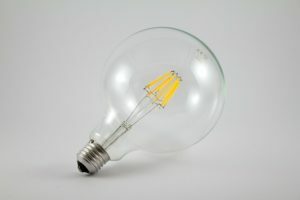 Homeowners are always looking for ways to be more energy efficient and LED bulbs are a fantastic way of achieving that! This entry was posted on Friday, September 7th, 2018 at 3:30 pm. Both comments and pings are currently closed.